This is where the Maps, Charts, and Illustrations of contributors to the Atlas are collected. This is a map of the Colronan Royalist mining colony of Arbol. Arbol Import/Export: The primary exporter of raw ore and refined silver on the island. Lusty Vulture: A famed tavern/bordello. For more information, see Arbol. The Jacobus Map is drawn on an old, tattered, stained piece of parchment. It seems to show the positions of four of the Major Islands (Colrona, Viridia, Barathi, and Crail — or possibly Lost Kroy) and three Minor Islands (all are unknown) in the Great Sky. 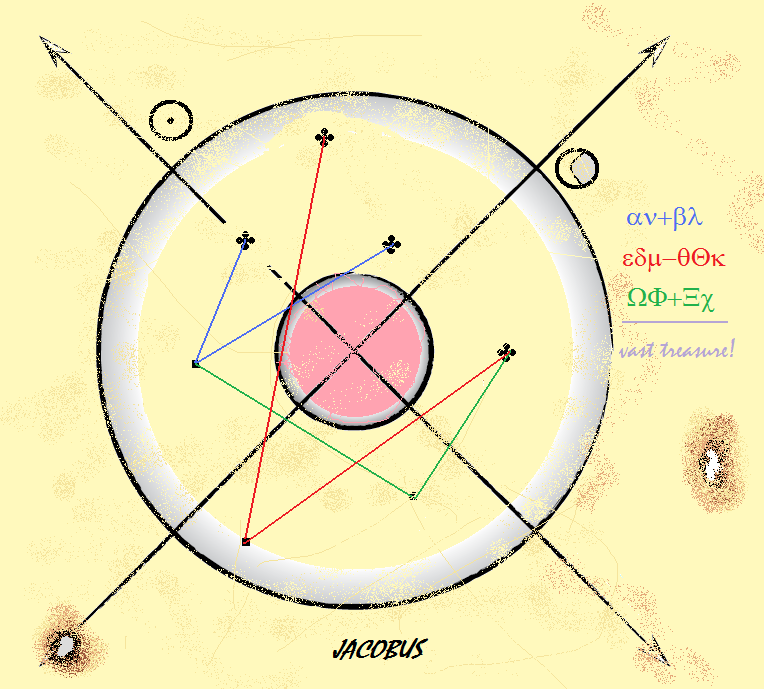 It is labeled with the title "Jacobus." While it seems unremarkable, it is much, much more. The Jacobus map is kolduncraft. Faint lines of red, blue, and green connect these islands in patterns. To the side of the map, some sort of ciphered information — possibly navigational information or calculations — corresponds to those colors. In addition, a pale violet glow illumines the words "vast treasure"! Given the expense and difficulty of constructing a kolduncraft map, it is likely that this artifact does point to some hidden cache of value. Any canny navigator or cipher-worker that can untangle the mysteries of the Jacobus Map is sure not to be disappointed! However, the code has thus far resisted breakage for decades. I kept the existence of this map secret for fourteen years, trying to discover its secrets — and acquire its treasure! — for myself. I have failed. Thus, for the simple satisfaction of seeing its code broken and someone gaining its booty, I have made it available in this most recent version of the Atlas. Bon chance, reader! This is the personal sigil of one of the very first Ilwuzi pirates of note: the Red Devil, possibly the only black-hearted dastard ever truly worthy of the title of "Pirate King." This symbol still strikes fear into the hearts of Colronans, be they of the Kingdom or the Zultanate: his cruelties to them are still legended in song and story. Some say that over the centuries, the tales of his depredations have grown… but contemporary histories give this the lie. The Red Devil was evil. On occasion, upstarts attempt to co-opt the Devil's sigil as their own banner. A tragic mistake. For, you see, the Ilwuzi Brethren of the Skull do not take kindly to anyone using that sigil. They slaughter any and all who fly under that flag, without remorse. More information on the Brethren of the Skull can be found in S7S, p. 69. If I ever see someone displaying that sigil, I will have their guts for garters! This illustration of the Dome of the Heavens shows both the location and the elevation of the major cloud islands within the Dome. Each cross on an island's stalk shows where it passes from one layer to another. Skyships have opened up the Seven Skies to trade and travel between the seven nations. International trade and travel flows through established, well-mapped and well-traveled routes between the major ports of the world. However, the three-dimensional aspect of the Seven Skies, meant that an accurate map of how the world was interlinked by trade and travel was either confusing or inaccurate. That was until seventy years ago, when Vincenzo Vascasi developed the map that would bear his name. 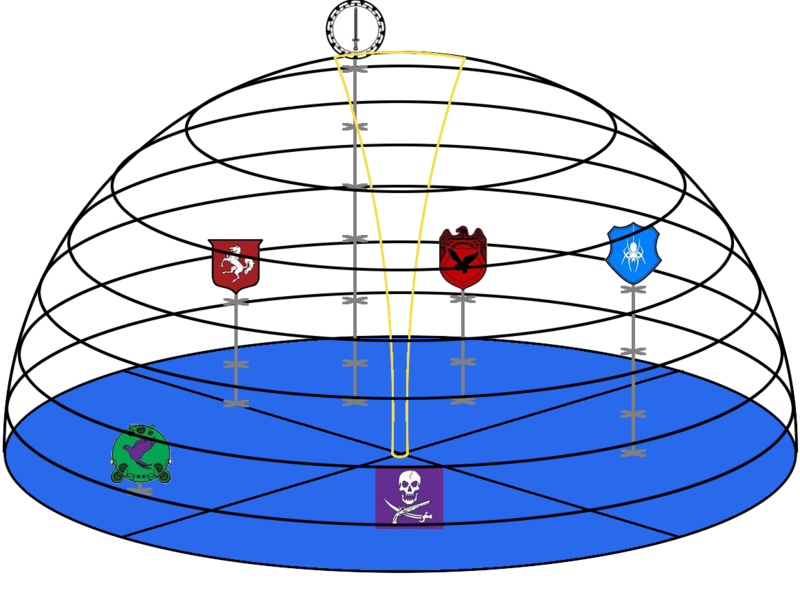 A simple yet effective representation of how each of the trading ports of the Seven Skies were interlinked. This is not to say that other routes exist, rather that these other routes have not been well mapped, have proven to be extremely dangerous, or simply have not yet been discovered. The Vascasi Map, above, shows the major skyship routes that have been in use since the destruction of Kroy and the subsequent Diaspora of its citizens. Each ‘link’ represents a mapped and relatively safe route to travel between each nation. The fact that Ilwuz is not represented with a permanent link to another nation merely shows the bizarre and random element of its here-then-gone-again nature. For more information, see The Captain's Rutter. Inspiration for the Vascasi map is taken from the Diaspora RPG. For a PDF of the compiled information about The Vascasi Map, including blank national and colonial trade routes see John's S7S Mediafire Folder.